It's Swan's way or the highway from now on, as finance guy takes over permanently from the engineer. Intel Corporation's new CEO is Robert Swan. He has been the company's interim CEO for seven months, and was formerly chief financial officer since 2016. Swan is the seventh CEO to lead the company based in Santa Clara, Calif.
"In my role as interim CEO, I've developed an even deeper understanding of Intel's opportunities and challenges, our people and our customers," Swan said. "When I was first named interim CEO, I was immediately focused on running the company and working with our customers. When the board approached me to take on the role permanently, I jumped at the chance to lead this special company. This is an exciting time for Intel: 2018 was an outstanding year and we are in the midst of transforming the company to pursue our biggest market opportunity ever." CFO Swan led the global finance, mergers and acquisitions, investor relations, IT and corporate strategy organizations. Prior to joining Intel, Swan served as an operating partner at General Atlantic LLC and served on Applied Materials' board of directors. He previously spent nine years as CFO of eBay Inc., where he is currently a director. Earlier in his career, he was CFO of Electronic Data Systems Corp. and TRW Inc. He also served as CFO, COO and CEO of Webvan Group Inc., and began his career at General Electric, serving for 15 years in several senior finance roles. Webvan was dotcom grocery delivery company which went bankrupt in 2001 after three years. Swan told CNBC at the time he became interim that he wasn't interested in the job permanently. He told John Fortt that while interim, he went from loving his day job to loving the company. "The second thing: I was asked." Swan is a finance buy, not a chip engineer like his predecessor. Brian Krzanich was CEO of Intel from 2013 until 2018, when he resigned unexpectedly after it came out that he a had an extramarital affair with a subordinate. Krzanich is now CEO of CDK Global which provides integrated technology services and solutions to over 27,000 automotive dealerships internationally, as well as vehicle manufacturers. Chairman Andy Bryant said Swan will lead Intel into a new era. "As Intel continues to transform its business to capture more of a large and expanding opportunity that includes the data center, artificial intelligence and autonomous driving, while continuing to get value from the PC business, the board concluded after a thorough search that Bob is the right leader to drive Intel into its next era of growth. Bryant said they looked far and wide before settling on one of their own. "We considered many outstanding executives and we concluded the best choice is Bob. Important in the board's decision was the outstanding job Bob did as interim CEO for the past seven months, as reflected in Intel's outstanding results in 2018. Bob's performance, his knowledge of the business, his command of our growth strategy, and the respect he has earned from our customers, our owners, and his colleagues confirmed he is the right executive to lead Intel." Swan has also been elected to Intel's board of directors. 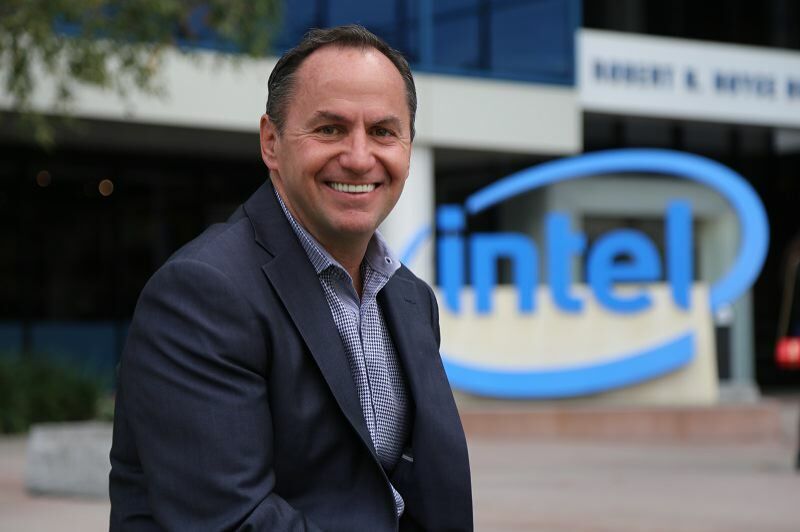 Todd Underwood, vice president of Finance and director of Intel's Corporate Planning and Reporting, will assume the role of interim chief financial officer as the company undertakes an internal and external search for a permanent CFO. "As we move into the next few weeks and months, we'll be focused on four critical imperatives. First, we must be bold and fearless. Intel's team has the technical and strategic vision to shape technology's future. Our ambitions have never been greater and we have a relatively small share of the largest addressable market in Intel's history. We must remain focused on playing offense and innovating for an increasingly data-centric world. A world where all data needs to be processed, moved, stored and analyzed. Second, our core strategy is not changing: We've embarked on what we believe can be the most successful transformation in corporate history. We are evolving from a PC-centric to a data-centric company that builds the technology foundation powering the world's innovations. What will change is how we serve our customers and how we partner and build the best technology together. By listening closely to how we can make our customers' lives better by helping them delight their customers, we will all win. Third, our execution must improve. And it will. Our customers are counting on us. Fourth, we have a powerful culture, and to achieve our ambitions we must evolve. Our culture must encourage every Intel employee to be bold and fearlessly focused on going beyond what they thought possible. And, the culture must honor truth and transparency, customer-obsession, and coming together as "One Intel." Intel has an amazing legacy, but our aspirations have grown. We need to continue to evolve to continue making Intel's future even brighter than our storied past."